Here at Peak Rescue Institute we offer a range of courses designed to help you become a competent rope rescue practitioner. All of our programs are accredited by the American Mountain Guides Association (AMGA). We offer two distinct program levels, Technician and Specialist. We can also provide customized contract courses to meet your team's needs. Tuition for both Joshua Tree courses include meals and camping fees. Visa, MasterCard, check and government purchase orders accepted. If you are interested in Scholarships check out our Scholarships page. PRI's Technician Level Course is an entry level program and no prior experience is required. However, even skilled rescuers will be challenged. The curriculum was developed to meet NFPA 1006 guidelines for Rope Technicians. Beginning in the Fall of 2015, we began introducing our Technician level students to the use of Two-Tensioned Rope Systems for rescue loads. Often referred to as twin-tensioned rope systems or mirrored systems, we are now teaching this system instead of the standard weighted main and un-weighted belay paradigm. Though there are many benefits to this system, the primary reason for this change is to minimize impact force on the rescuer and patient in the event of a line failure. 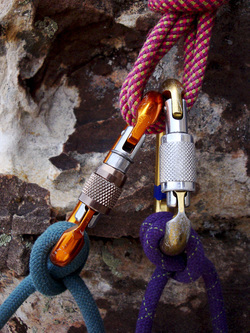 We plan to briefly review the main and belay system before moving on to the two-tensioned rope system paradigm. The course culminates with a mock rescue scenario where each student will function as a rescue team member in a real time exercise. Successful completion of a skills test will be required to obtain a NFPA 1006 certificate. Successful completion of the Technician Level course will allow graduates, assuming continuing practice, to function effectively as a rope rescue team member. PRI’s Specialist Level course is designed for Technician Level graduates who have a solid background in technical rope rescue and have a desire to build on their skills. As a prerequisite for our Specialist Course, you must have completed a 40-hour minimum Technician level rope rescue course. You must submit documentation of course completion. You may be asked to submit a course description or curriculum if we are not familiar with the specific course that you attended. On the first day of the Specialist Course, students must successfully pass an evaluation of Technician Level skills. Please refer to the Specialist Course policy below. Less time will be spent on specific techniques and more time on concepts in rescue. There are often a number of ways to accomplish the same task and students will be encouraged to apply what they know to rescue solutions. Several real-time scenarios will be presented including a night exercise. Students will be encouraged to take leadership roles on the team. Completion of the Specialist Level Course will increase the graduate's effectiveness on their rescue team and give them needed skills to begin to take a leadership role. Participation in our Specialist course requires successful completion of a pre-course evaluation of skills. This is for the benefit of the registrants and their fellow students. In the event that one is unable to complete the skills test satisfactorily they may be given an opportunity to participate in the Technician Level program if space is available. Complete information regarding the evaluation will be sent and we encourage potential Specialist students to call with any questions. By registering in the Specialist course, the prospective student and/or their agency consents to participation in the Technician course in the event that the student does not pass the pre-course evaluation. No Refunds will be given for students who wish to leave the course instead of being enrolled in the concurrent Technician course. If you are interested in a contract course of have any questions please contact us below.